Best Route strategy version 1. This strategy forwards a new Interest to the lowest-cost nexthop that is not same as the downstream, and does not violate scope. Subsequent similar Interests or consumer retransmissions are suppressed until after InterestLifetime expiry. This strategy is superceded by Best Route strategy version 2, which allows consumer retransmissions. This version is kept for comparison purposes and is not recommended for general usage. Definition at line 56 of file best-route-strategy.hpp. Definition at line 61 of file best-route-strategy.cpp. 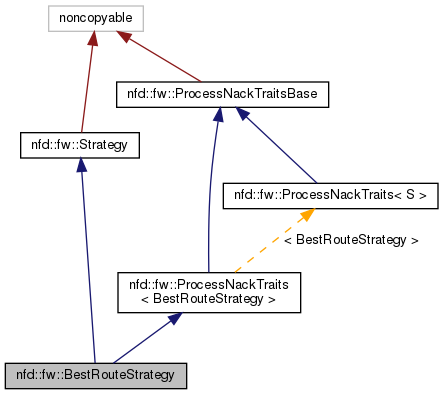 Definition at line 76 of file best-route-strategy.cpp.